This section describes high-capacity equipment with proven or potential application for the recovery of placer gold. Many of the devices discussed here were only recently designed ormodified to enhance the recovery of very fine-grained minerals. Most are suitable for use in byproduct recovery plants or other applications with high capacity processing demands, but some types of equipment can be used successfully in smaller operations. Equipment described includes jigs, cones, spirals, centrifugal concentrators, and pinched sluices. Pinched sluices have been used for heavy-mineral separations for centuries. In its elementary form, the pinched sluice is an inclined trough 2 to 3 feet long, narrowing from about 9 inches in width at the feed end to I inch at discharge. Feed consisting of 50-65% solids enters gently and stratifies as the particles flow through the sluice and crowd into the narrow discharge area. Heavy minerals migrate to the bottom, while lighter particles are forced to the top. This separation is inhibited at the walls of the sluice due to drag force. The resulting mineral bands are separated by splitters at the discharge end Pinched sluices are very simple devices. They are inexpensive to buy and run, and require little space. Pinched sluices and local variants are mainly used for separation of heavymineral sands in Florida and Australia. Models that treat ore material are also used. Recovery difficulties result from fluctuations in feed density or feed grade. A large number of pinched sluices are required for a high capacity operation, and a large amount of recirculation pumping is required for proper feed delivery. These drawbacks led to the development of the Reichert cone. 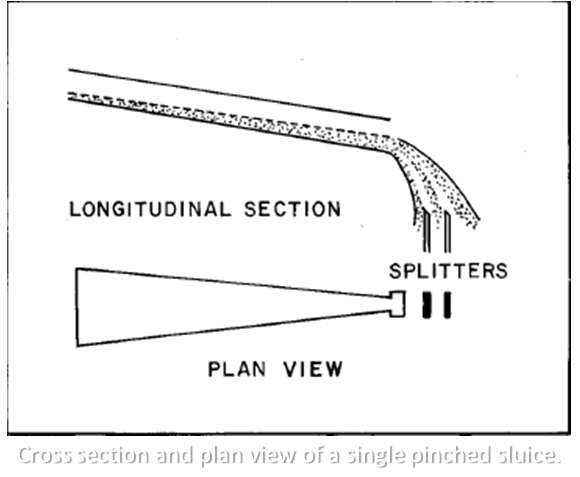 Cross section and plan view of a single pinched sluice. The Reichert cone concentrator is based on the pinched sluice concept. If a number of pinched sluices are arranged side by side, with the discharge ends pointed inward, they will form a circular tank with each sluice forming an individual compartment. Removing the sides of each sluice forms a circular tank with an inverted cone for the bottom, a basic Reichert cone. This design eliminates sidewall interference during mineral separation. The Reichert cone concentrator is an Australian innovation developed by Mineral Deposits LTD., of Southport, Queensland, Australia. A single unit is formed from several cone sections stacked vertically to permit multiple stages of upgrading. The cones are made of fiberglass, covered with rubber, and mounted in circular self-supporting frames over 20 feet high. These weigh only 2 1/2 tons for a 75-ton-per-hour feed capacity. Reichert cones accept feed with a density of between 55-70% solids by weight. The unit is very efficient at recovering fine particle sizes and effectively concentrates material from 30 to 325 mesh (roughly 0.5mm to 45 microns). In a test at the Colorado School of Mines Research Institute (CSMRI), a measured sample processed in a Reichert cone yielded a concentrate which contained 95% of the gold (free gold and sulphides) that represented 28% of the original feed weight. Other tests found recoveries of free gold in excess of 90% and consistent recovery of gold smaller than 325 mesh (45 microns) (Spiller, 1983). 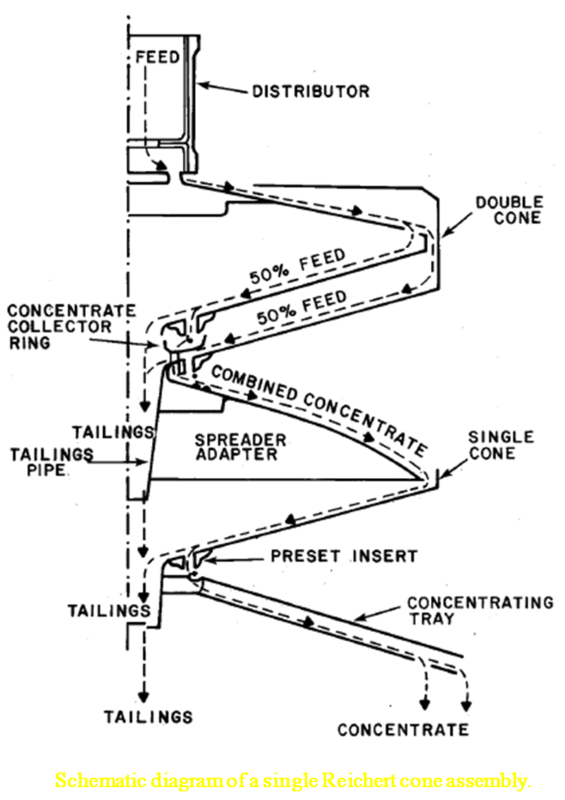 In operation, the feed pulp is distributed evenly around the periphery of the cone. The flowing feed material acts as a dense medium that hinders the settling of lighter particles. Heavy material settles to the bottom of the flow. The concentrate is removed from the pulp stream by an annular slot in the cone. The efficiency of one separation is relatively low and is repeated a number of times within a single unit. Feed fluctuation must be controlled to within fairly close tolerances, and the proportion of clay sizes to feed should be below 5% for maximum recovery. Concentrates for Reichert cones are usually cleaned in spiral separators or shaking tables although some operators use cones for all phases of concentration. Reichert cones have no moving parts and very low operating costs. They have a long equipment life with low maintainence. Another advantage is that they use less water than conventional jigs and sluices. The success of cone circuits in Australia has led to their application for concentration of tin, gold, tungsten, and magnetite. In many applications, cones are replacing spirals and shaking tables. Reichert cones are very effective, high-capacity gravity separation devices. They are lightweight and compact, and have a low cost per ton of processed material. They are suitable for use as roughers, cleaners, or scavengers. Disadvantages include a high sensitivity to variations in pulp density and unsuitability for operations with feed rates of less than 50 tons per hour. This unit should be considered where large volumes of fine gold or other fine minerals are to be recovered and where limited wash water or plant space is a factor.